Spoilers below for the most recent episode of Better Call Saul. Every episode of Better Call Saul delivers something for audiences to dig into, be it an emotionally leveled performance from Bob Odenkirk or a story thread that won’t entirely reveal itself, or both and more. And then, of course, there is the back-of-the-mind anticipation for a surprise Breaking Bad cameo. 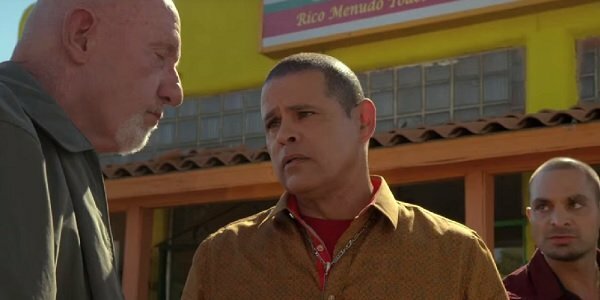 Monday night’s episode saw the return of Raymond Cruz’s Tuco Salamanca, who spent a good part of his appearance doing what he does best: being violent. In one scene, Jonathan Banks’ Mike gets his face bashed in by Tuco, and Cruz says putting that bit together was quite a rough experience. Shooting it was vicious. They’re yelling, ‘Just keep throwing them! Just keep throwing them!’ And I’m trying not to hit Jonathan. You have to be careful for that stuff. But you want to sell it. You want it to look real. There’s a special kind of violence with Tuco. It’s not normal. It’s exaggerated. It’s more vicious. How crazy is Tuco? Not only does he just keep punching Mike in the face for holding onto his shirt, but Tuco delivers the knockout punch after the cops have shown up and are right behind him. As such, Raymond Cruz can’t be expected to stand there and swing his fists in a manner that comes across as anything but designedly savage. Perhaps that’s how the small-timer Daniel would do that kind of thing, but not Tuco. Cruz told People that he threw “maybe 120 punches” right at Banks’ face. Sure, he didn’t have to worry about breaking his fingers on anyone’s face, but Cruz still had to be feeling it in his arm pretty strongly by the time that scene was finished filming. Banks is probably lucky that Cruz’s arm didn’t turn to jelly, as mine would have, thus affecting his ability to stop his knuckles from continuing their journey to the side of Banks’ skull. Might have made for a cool scene, though. If you didn’t get a chance to check the one-way beating out when the episode aired, you can catch it below. We all knew that Mike wasn’t going to actually kill Tuco for Nacho, since that would make Tuco’s presence in Breaking Bad a universe-swallowing abnormality, but I didn’t immediately expect him to draw from the cop side of his brain to set Tuco up. As a parting gift, Mike should get some of those prescription drugs that Nacho is dealing with for his face. Don’t expect to witness Walter White putting his dukes up on Better Call Saul any time soon, but we’ll probably get to see more familiar faces as the weeks go by. Most importantly that of Jimmy McGill. Better Call Saul airs Monday nights on AMC.